Cleartrip has launched an interesting solution that will be mighty beneficial for international travelers. One of the most difficult task for an international traveler is to time the purchase of his tickets so he gets the best deal. Air-fares are volatile – They keep changing depending on various factors including oil prices, exchange rates, demand & supply, and the end user never knows when the ticket prices will fall or when they will rise. With Cleartrip’s pricewatch, this guess work is taken out of the picture. Travelers can book the tickets anytime without worrying about the price fall. Pricewatch guarantees that traveler will get the lowest rate from the time of the booking. What pricewatch does is basically offers you the money back when the price falls. For example, if you have booked a one-way ticket at Rs. 30,000 from Delhi to New York on March 1st for a flight which leaves on 30th March. Now on the 15th, price of the same flight comes down to Rs. 27000/-. Cleartrip’s price watch will refund the difference of Rs. 3000 back to you ensuring that you get advantage of price fall. It is interesting that Cleartrip would launch such a platform. While it is great for consumers, pricewatch will definitely bring the Airfare war back. Early in 2010 – 2011, all the OTA’s were playing the “lowest airfare” card to woo customers. But with margins falling for Airlines and subsequently for OTA’s, pricing card was played lesser and lesser. It was more about features and extra benefits. But with Cleartrip launching Pricewatch, it looks like the Airfare price war is back! 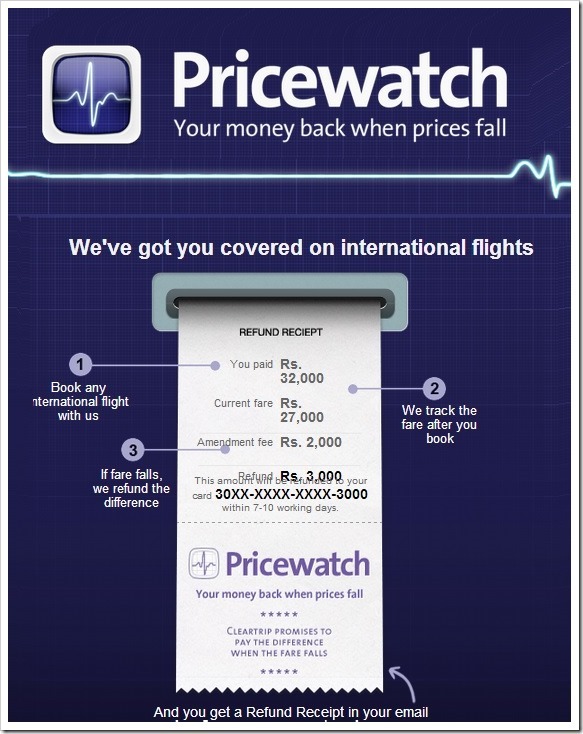 Do try Pricewatch if you are planning to book an international flight ticket anytime soon, you may end up saving money! "Cleartrip Pricewatch: If ticket prices fall, you get your money back! ", 5 out of 5 based on 1 ratings.